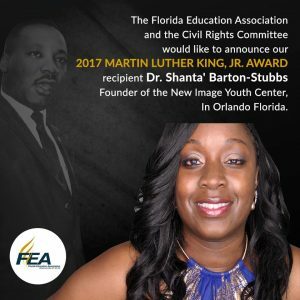 Founder and Executive Director of New Image Youth Center was recently honored by the Florida Education Association’s Civil Rights Committee with the 2017 Martin Luther King, Jr. Award. Contributing directly to the motivation of individuals or groups in seeking self determination. Showing creativity and determination in achieving human and civil rights goals. Establishing an ongoing program or institution for the improvement of human relations and civil rights. Exemplifying the nonviolent philosophy of Martin Luther King, Jr. and other nonviolent activists in the quest for improved human relations and civil rights. Dr. Barton-Stubbs was recognized at the FEA Delegate Assembly this October. From the entire New Image Family: Congratulations, Shanta! !